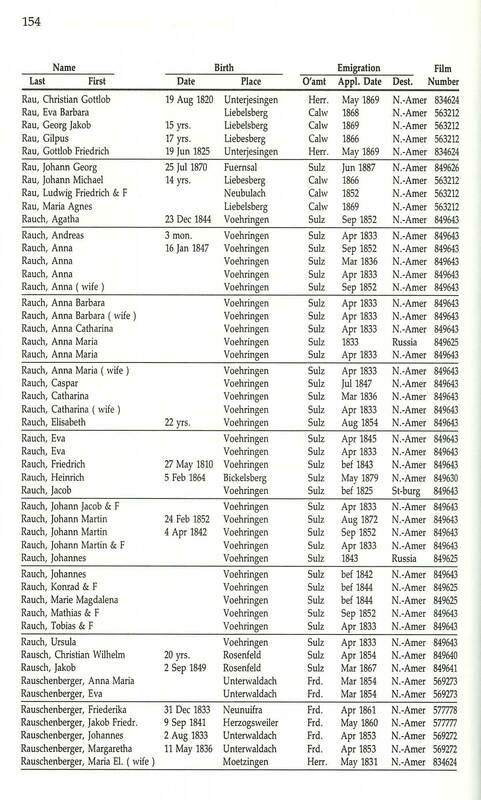 On the 14 March 1828, Anna Catherine Rauch was born to parents Tobias Rauch and Anna Maria Geiger.A They lived in Vöhringen am Neckar, in the administrative district (or county) of Sulz in the independent state Württemberg, although the region has not been know by that name since the formation of Germany and first world war. 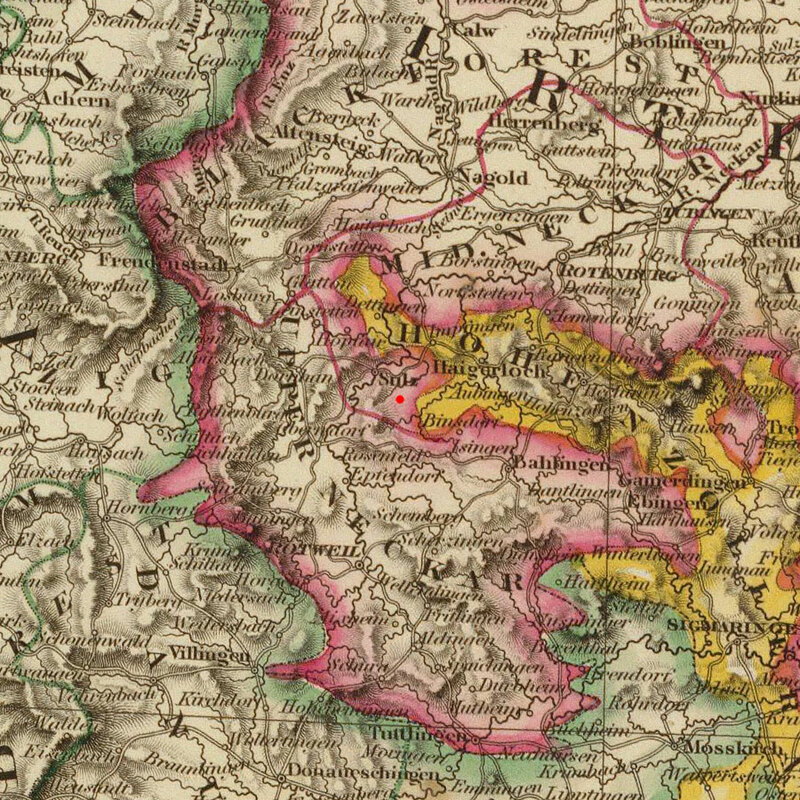 The area is now known as Vöhringen, Rottweil, Baden-Württemberg, Germany. Catherine was baptized in the church of Vohringen two days later on the 16th of March. At the time in Germany it was common practice for newborn children to be baptized within the first few days of life. Of the people listed as godparents for Catherine's birth, the standout is Tobias' brother Jacob Rauch. 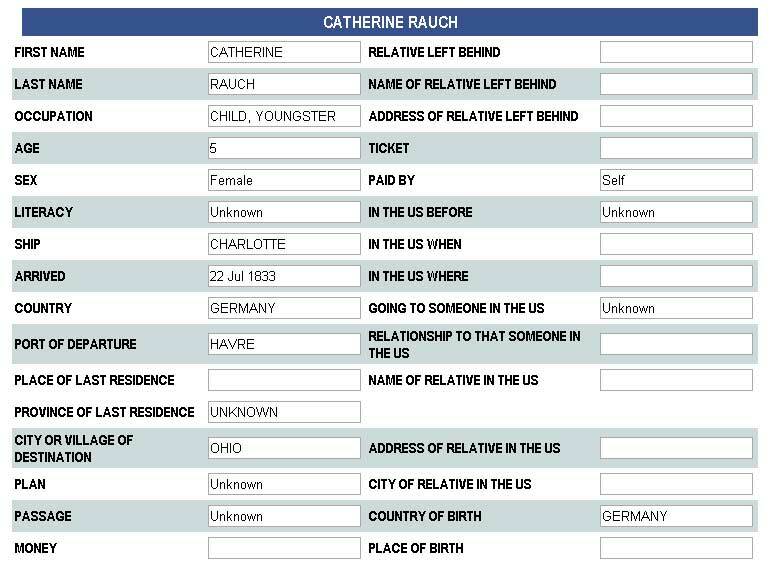 In April of 1833, shortly after Catherine turned 5, the Rauch family made the decision to leave Germany and formally registered for emigration. They departed from Havre, France aboard the Charlotte and arrived in New York, New York on the 22 Jul 1833. The stated destination of the arriving passengers on the Charlotte was Ohio. 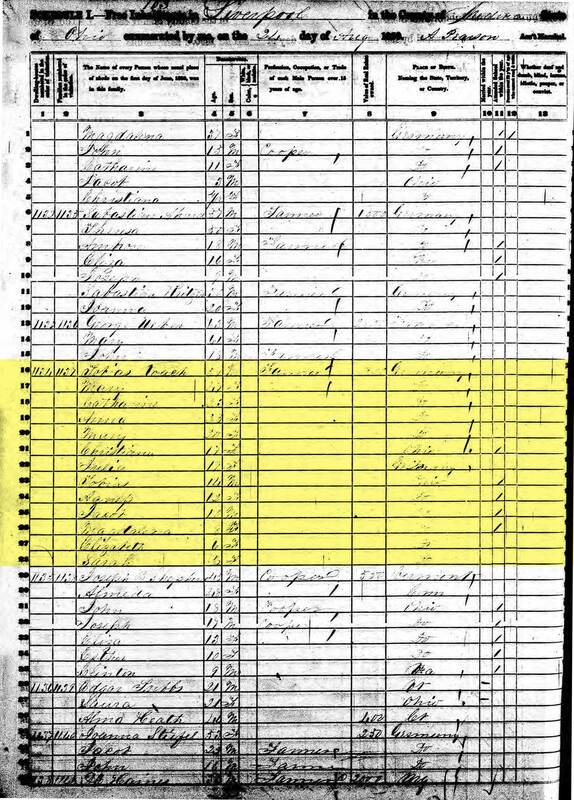 The 1850 census was taken on the 22 August where we find Catherine and her family still in Liverpool Township. They were living on a 30 acre farm, 25 of which had been improved (cultivated/cleared) and valued at $800. The farm cared for 3 Milk Cows, 2 Oxen, 4 Calves and 8 Pigs. The previous season's crops had harvested 88 bushels of Wheat, 50 bushels of Indian Corn, 12 bushels of sowed Oats, 20 bushels of Irish Potatoes, 10 bushels of Barley, 150 lbs. of Butter, 12 tons of Hay, 2 bushels of Clover seed, 1 bushel of Grass seed and 30 lbs. of Maple Sugar. 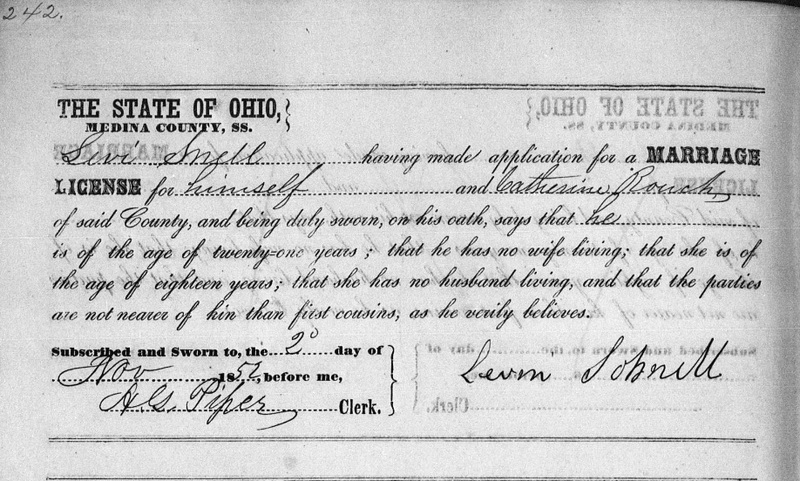 On the 02 Nov 1852, Levi Schnell applied for a license to marry Catherine Rauch in Medina County, Ohio. The wedding went forward five days later on the 07 Nov 1852 when Catherine Rauch and widow, Levi Schnell were married by John Sutz. 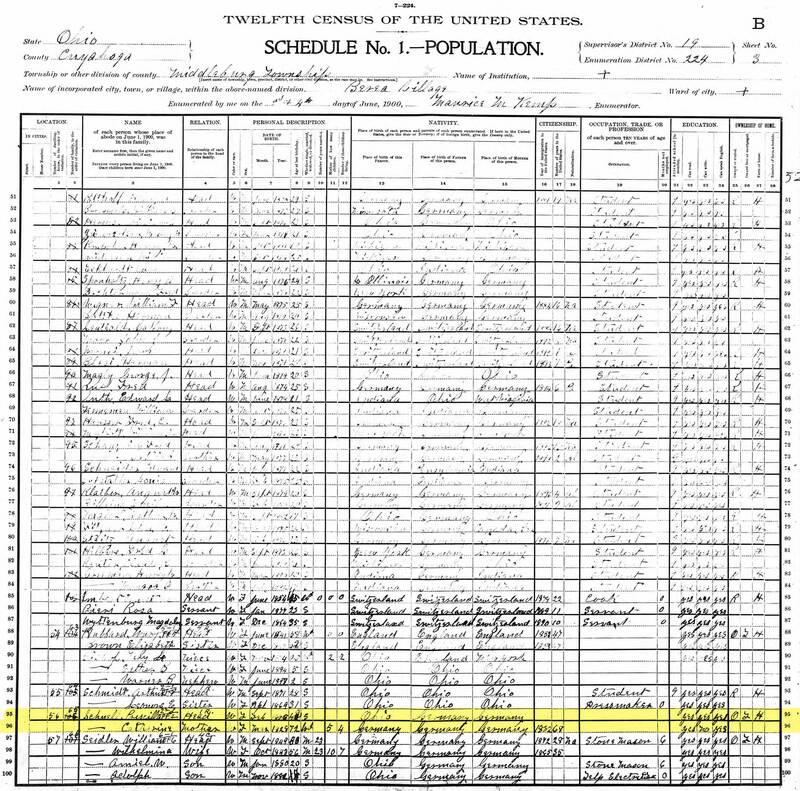 Catherine gave birth to their first child, Samuel Solon Schnell on 22 Apr 1854 in what Samuel's obituary states is Valley City, a small town in Liverpool Township. 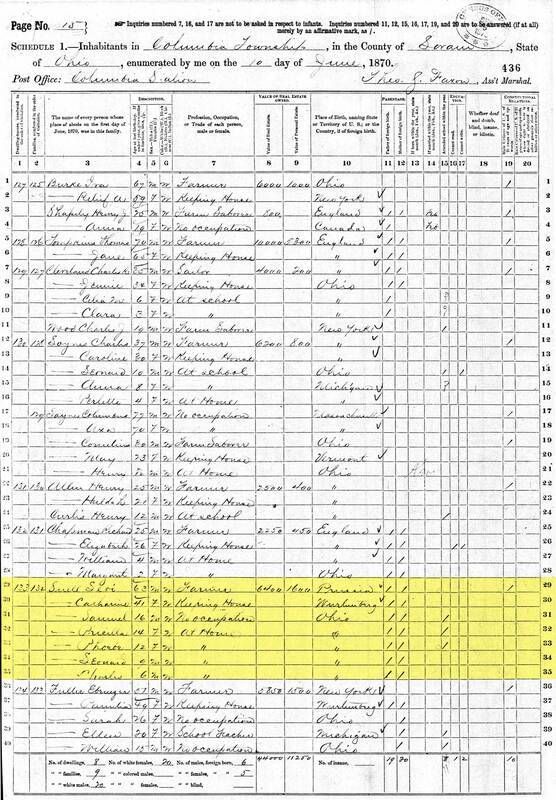 Following Samuel were his four siblings, sisters Priscilla in 1856 and Phebe in 1859, and brothers Leonard in 1860 and Charles in 1866. 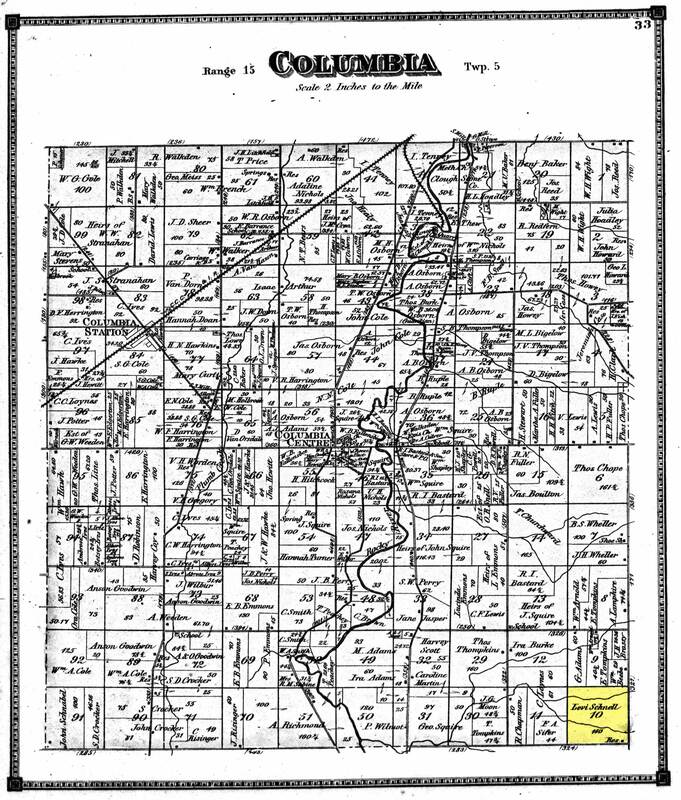 On 1 Mar 1856, Catherine's parents sold their property, left Ohio and headed west to Linn County, Iowa. Levi's eldest son Lewis, who was now about 18 joined them on their journey. Once in Iowa, Lewis would take up residence with step-aunt Mary Anna (Rauch) and her husband Andrew Steinagle, and work as a farmhand on their farm. 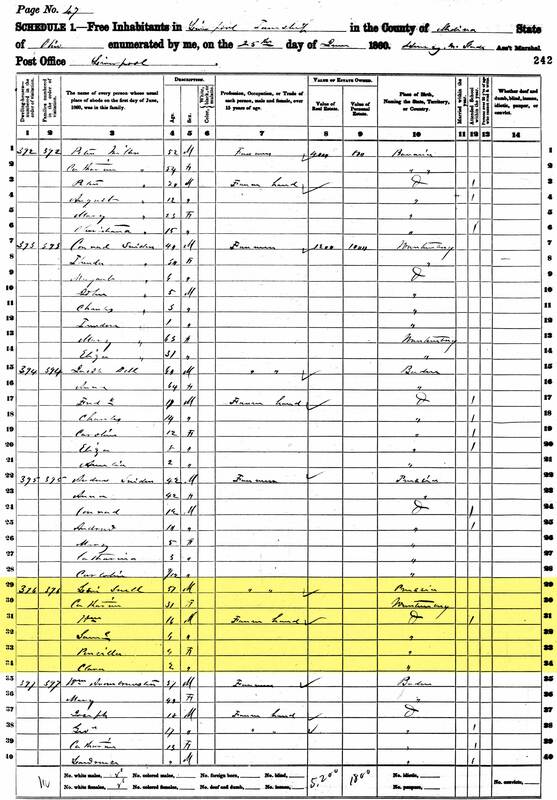 By 1860, we lose track of the Levi's daughters from his first marriage. Whether their absence is through death or marriage is unknown. 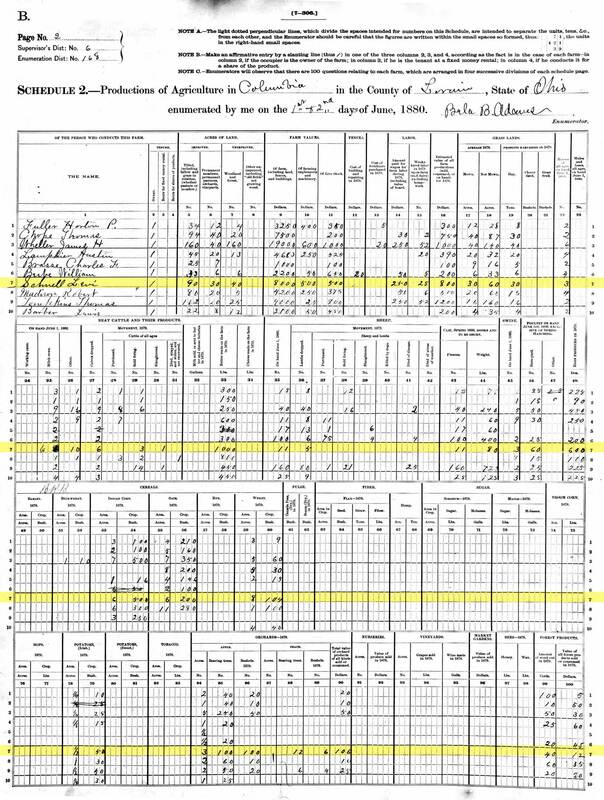 There are no records that I have been able to uncover to show they ever married in Ohio and death records aren't reliable before the 20th century. The family is still in Liverpool Township and joining them is son William, working as a farmhand on the family farm with his step-siblings. 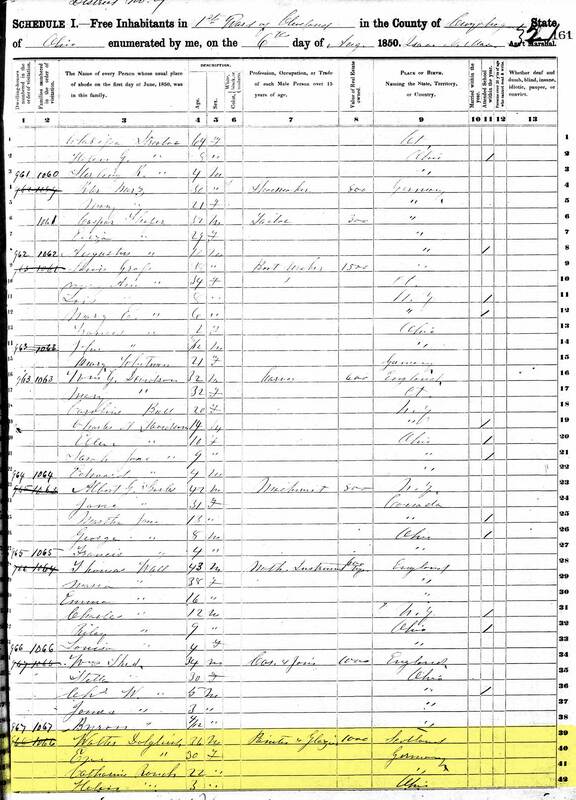 When the Civil War broke out in 1861, Lewis took up arms for the Union in Iowa, enlisting on the 20 Sept 1861 in Iowa's 12th Infantry Co. D. Brother William followed suit in Ohio on the 13 Aug 1862 when he joined the 107th OVI, Co. D... William fared far better than his brother. Lewis died in July, one month before William registered for war. It's believed he was injured at the Battle of Shiloh in Tennessee and taken prisoner by the Confederates where he was relocated to Fulton County Jail in Atlanta. He died 3 months after the battle of either his wounds, disease, or possibly malnutrition. After the war, William moved back home and worked as a farmhand around town before eventually moving out to Denver, Colorado. 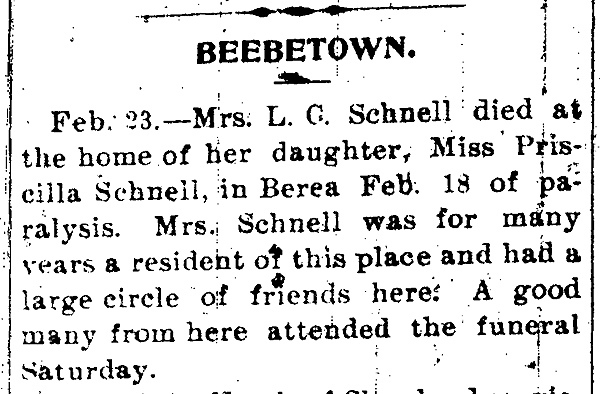 By 1870, the Schnell family relocated to BeebetownF, a small village along the borders of Medina, Lorain, and Cuyahoga Counties at the intersection of Boston and Marks Roads. The Levi owned the property at the northwest corner of this intersection (the northwest corner falls within the jurisdiction of Columbia Township). 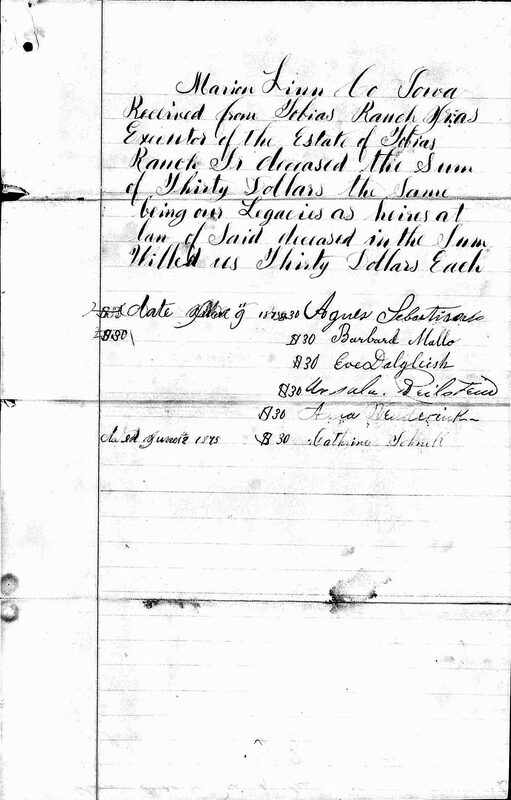 At this time Levi is now primarily listed as a farmer, owning property worth $6400 and personal property worth $1600. Levi died on 27 Feb 1881 in Beebetown. He was buried in Beebetown Cemetery at 77 years, 7 months, 5 days. His cause of death was not reported. It's not clear what happened in the years following Levi's death. 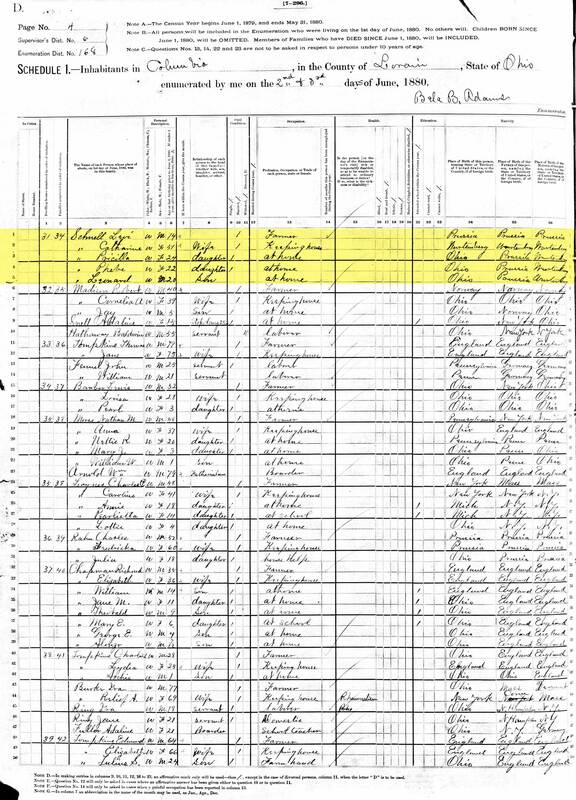 I know the Schnell property remained in the family (at least in part with son Leonard), but by the 1900 census, Catherine was no longer living in Beebetown. She was now 72 years old and living at her daughter Priscilla's home in Berea, Ohio. 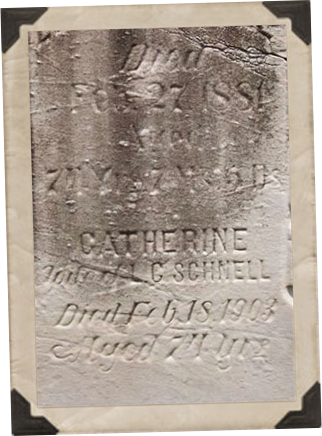 Catherine died in Berea, at her daughter's home, on 18 Feb 1903 of paralysis. She was 74 years old. She was laid to rest in the Beebetown Cemetery next to her husband and son Charles. 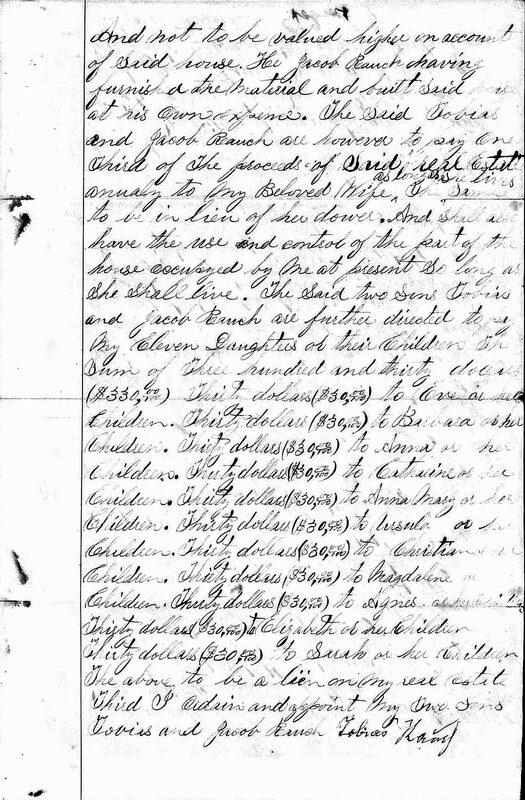 AOriginally noted as 14 May 1828 by FamilySearch, however baptism record actually says March and can be confirmed via the order of the baptism records in the parish register.